Hi friends - it's S@ndy here with you at Terminal 4. 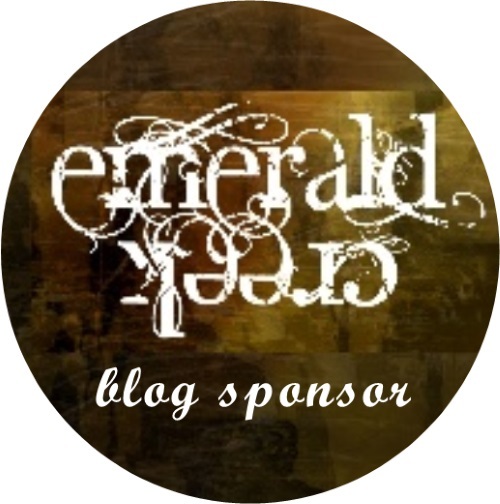 It has been quite the creative journey this month with our three previous guides. Astrid, Tracy and Amanda have shared so many great techniques and projects with us, so inspiring. Thank you. My project today is inspired by one of my team mates on the Pop it Ups Designer Challenge Team, Shelly Hickox, who made a fantastic journal cover for a challenge. I loved it so much that I decided to do my own take on it for a summer travel journal. We are traveling abroad this year and I want to capture all the wonderful memories in this journal with photos and notes. The journal cover was given a coat of Distress Picket Fence. Not full coverage - rather hit and miss. 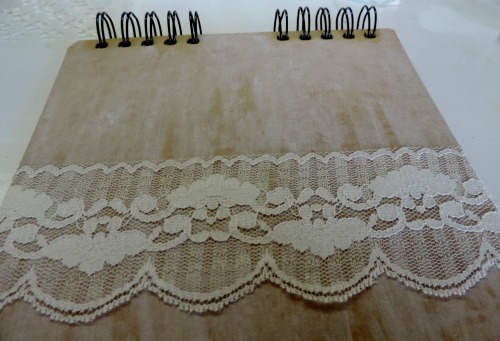 Add a length of lace across the front near the bottom edge. I used watercolor card - 2 pieces, both torn on the bottom edge. 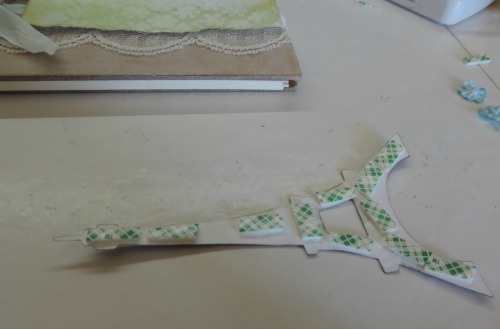 Using gesso and a color blender - the gesso was dabbed through stencil. I used two stencils from Karen Burniston, the Flowers Stage It Stencil on the bottom portion of the panels and the Partly Cloudy Stage It Stencil near the top for a couple clouds. Since I don't have Brushos I used these Nuance colors from Magenta which work the same way. It takes very little powder (shown by the arrow) to make lots of color. I sprinkled the powder on the paper and then misted it with water - boom - it's like an explosion of color, in this case, blue. Set aside to dry or if you don't like to wait, use your heat gun. I used the excess color left on the non stick mat to color my ribbon. 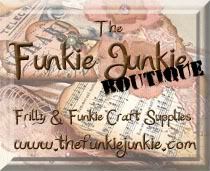 Idea - ology Crinkle Ribbon was used here. Simply cut your length of ribbon, wet it, drop in color, making sure all the ribbon has color on it. Then dry with heat tool. 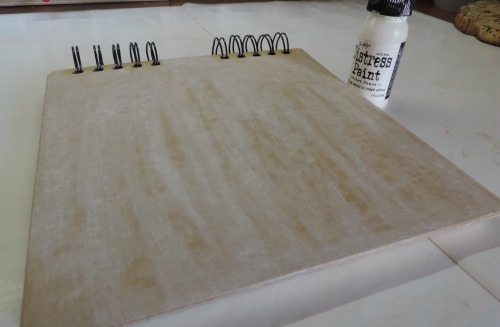 After the blue color dried, Peeled Paint Distress Ink was added to bottom portion. Next a light buffing over the gesso to reveal the white. Then comes a little Distress Vintage Photo Ink on the edges. I added the ribbon next and tied a bow. Next the two panels were added with the longer one on top of the ribbon. 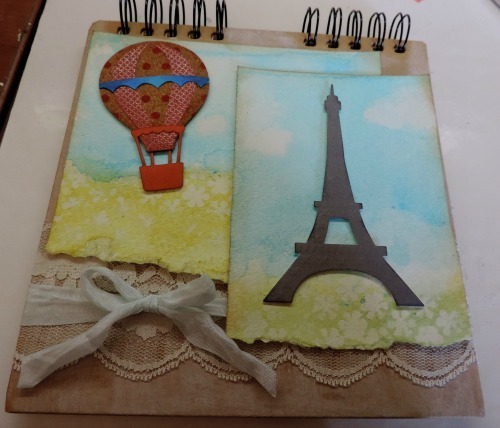 I die cut the Eiffel Tower from the Eiffel Tower Pop Stand Die and a hot air balloon from the Hot Air Balloon Pop Up Die both from Karen Burniston for Elizabeth Craft Designs. Double sided foam adhesive was added to both pieces to give dimension. 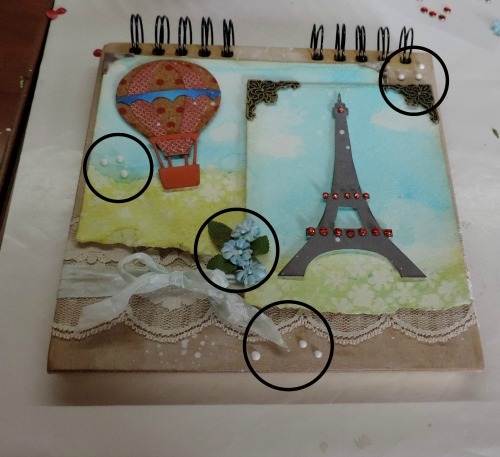 Add tower and balloon to card and then add some splatters using watered down gesso and a fan brush. Then came some leaves and three small flowers from Prima near the center. I then added three groups of white dots made with Crystal Drops from Nuvo (shown in the circles above) These dry dimensional. I also dressed up the tower with some rein stones. Some corners from my stash were added to the top corners of both panels. 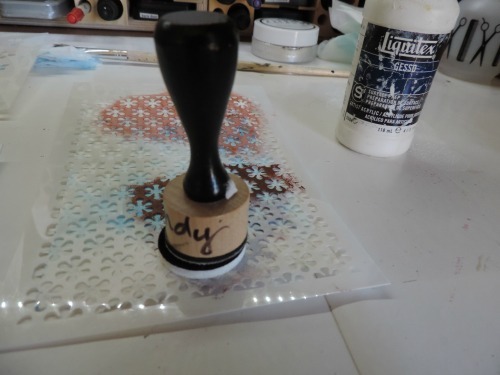 The finishing touch is a tag with a stamp from the Just a Note Clear Stamp Set that says Bonjour. Thanks for joining me today for this leg of the journey, I hope you are as inspired as I was and will be making a journal for yourself. 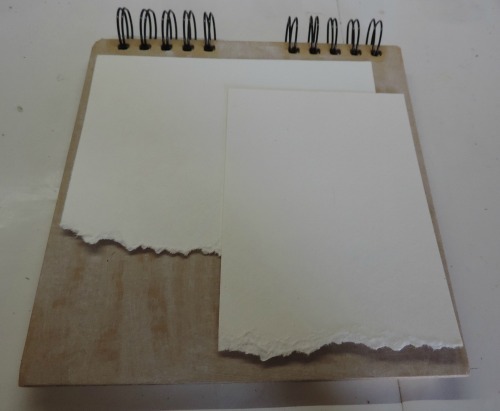 Fabulous cover Sandy, the gesso resist worked brilliantly on your panels and that blue is such a gorgeous colour. 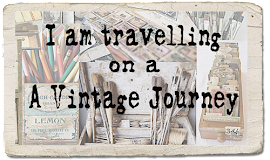 A wonderful tutorial and great use of the content of your travel bag! 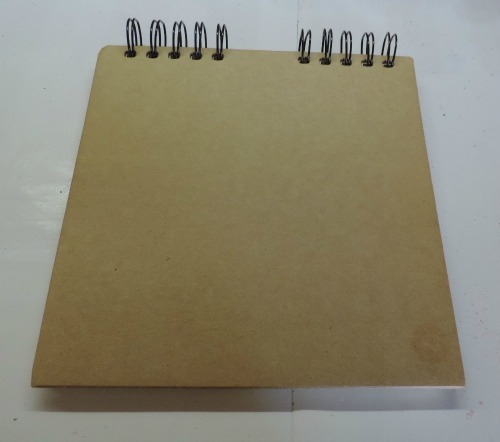 Such a lovely Journal cover! Sandy - the perfect place to keep all those special memories form your travels this summer. 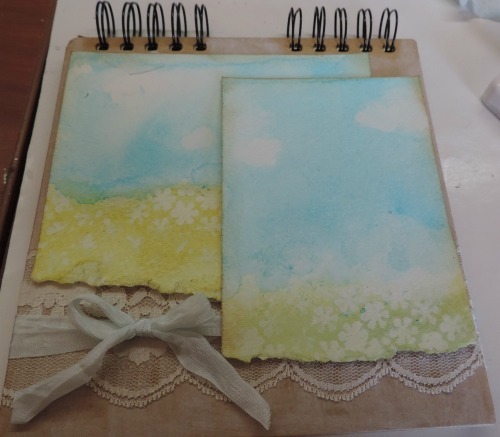 The gesso resist is wonderful as are those blue summer skies. Great use of the goodies in the travel bag . Hope you have a fabulous vacation . 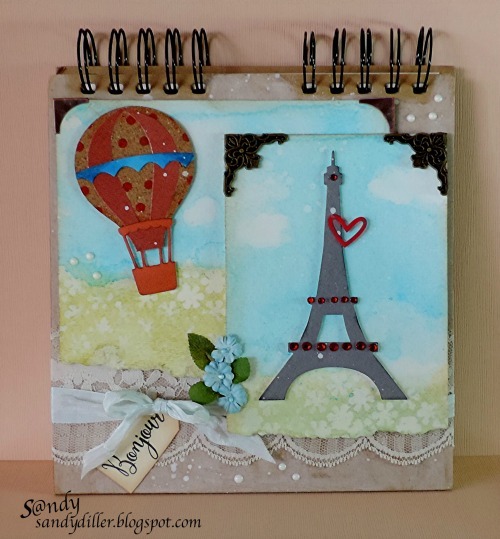 What a beautiful travel journal you created Sandy! 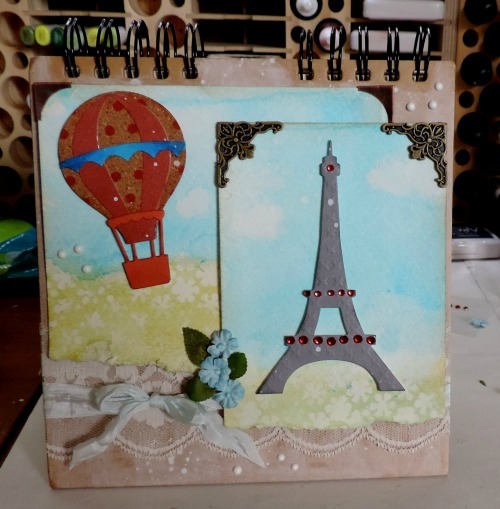 love the Gesso resist technique on the panels and your pretty balloon and Eiffel Tower die cuts - a lovely place to put your travel photos and souvenirs!